What’s your favorite part of your job? Working with and helping grantees and working with my co-workers. I also love seeing the Cultural Facility projects when they are completed. Being involved with people who love the arts. Are you an artist yourself? Yes, I am a poet and my MA is in Creative Writing. Welcome back to our blog, which has been too quiet for too long! We’re starting a new ongoing feature: welcome to Team Member Tuesday! We’ll be spotlighting a Division team member every week. 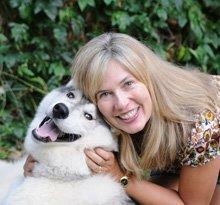 This week, we’ll kick off with one of our newer program managers, Michelle Smith Grindberg. I began my position in April 2015. 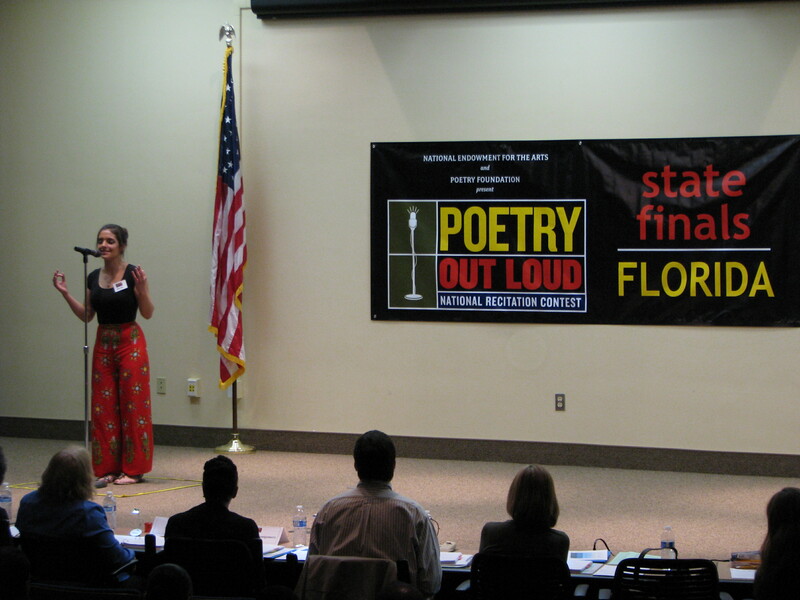 Forty-two students from across Florida competed in Tallahassee on Saturday, March 1 for the Florida Poetry Out Loud State Finals. 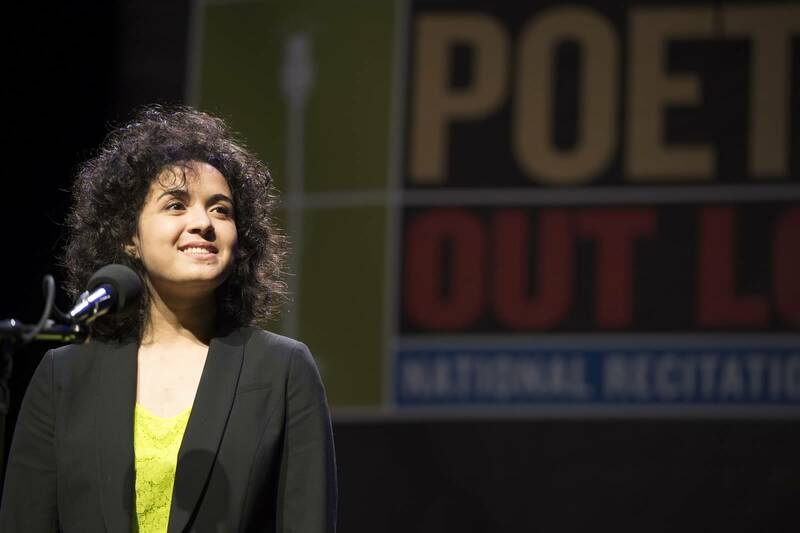 This year, the Poetry Out Loud program in 28 of Florida’s counties assisted more than 15,000 secondary-level students in learning about poetry in their classrooms. The Florida Division of Cultural Affairs oversaw outreach to schools and communities around the state spanned many of Florida’s school districts and regions. 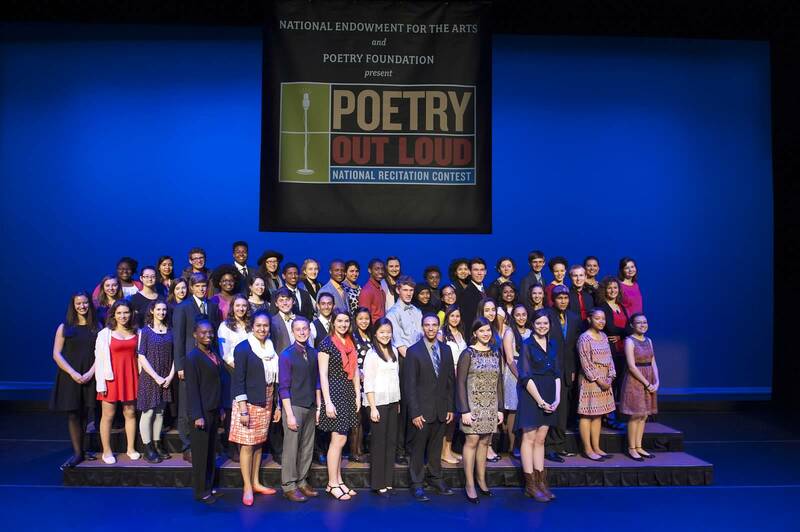 The Poetry Out Loud competition begins at the classroom level. 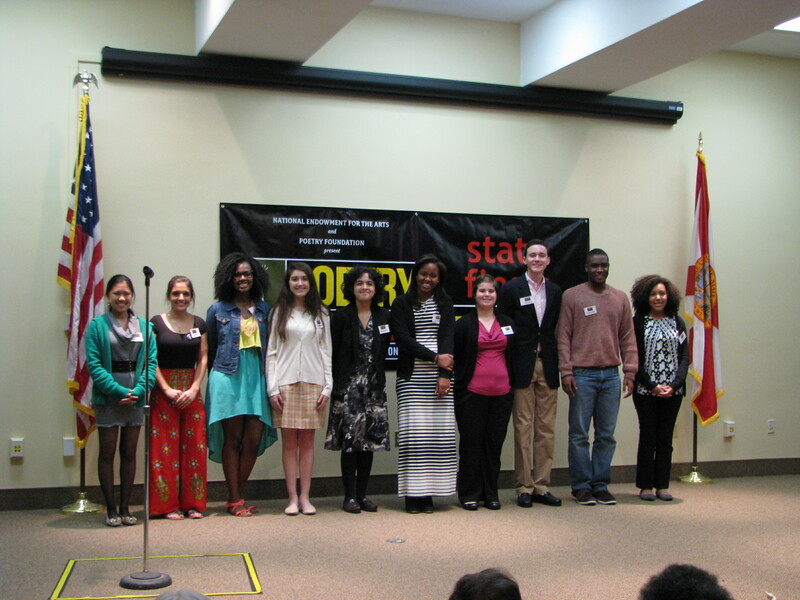 Winners advance to a school-wide competition, then to the state competition in Tallahassee. Each state winner ultimately competes in the National Finals in Washington, D.C. Teachers at more than fifty Florida high schools completed this program through to the end, and forty-two schools were represented in the State Finals competition. 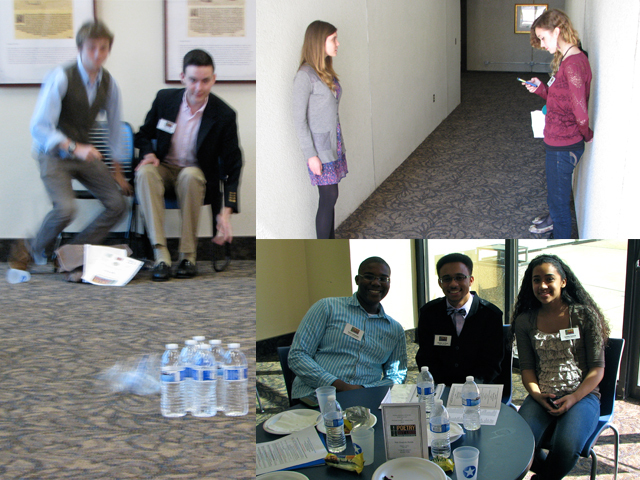 The photos below depict the exciting and poetry-filled day these students had. Forty-two students from across the state who won the individual competitions at their own schools came to Tallahassee and competed on March 1. 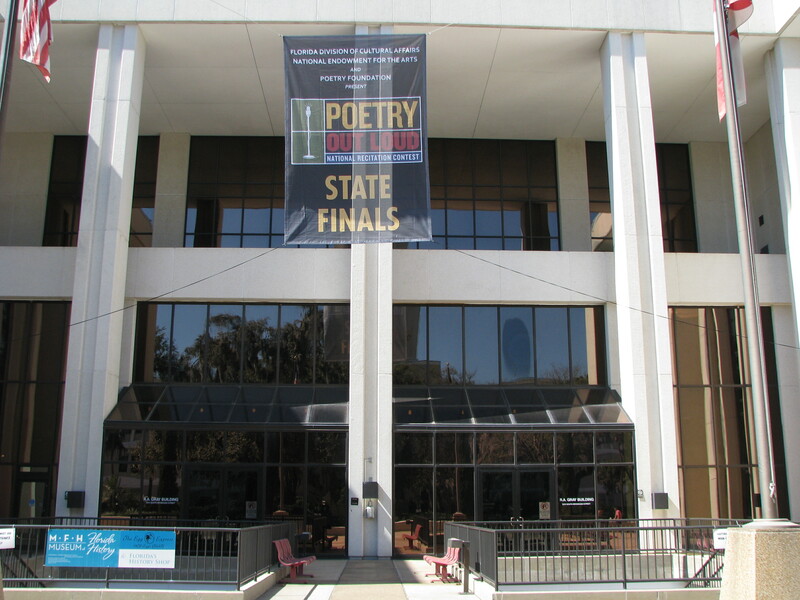 The competition was held at the R.A. Gray Building in downtown Tallahassee. 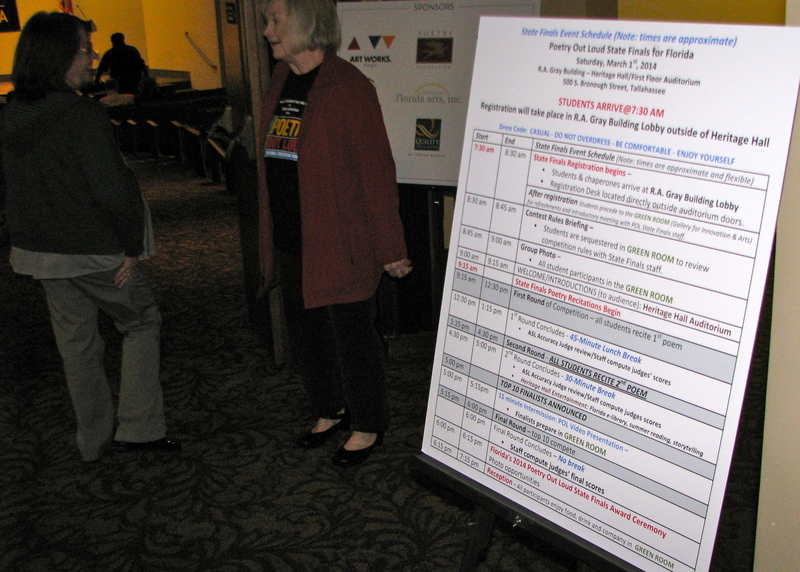 As this schedule of events shows, students had a full day. All students recited a poem in the first and second round. 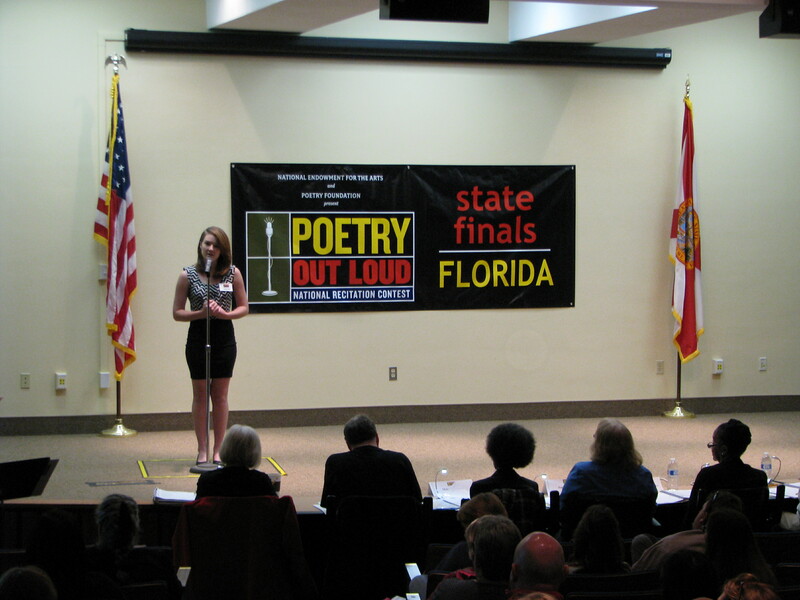 Cassidy Camp of Coral Shores High School in Monroe County presented “Baudelaire” By Delmore Schwartz in the first round. 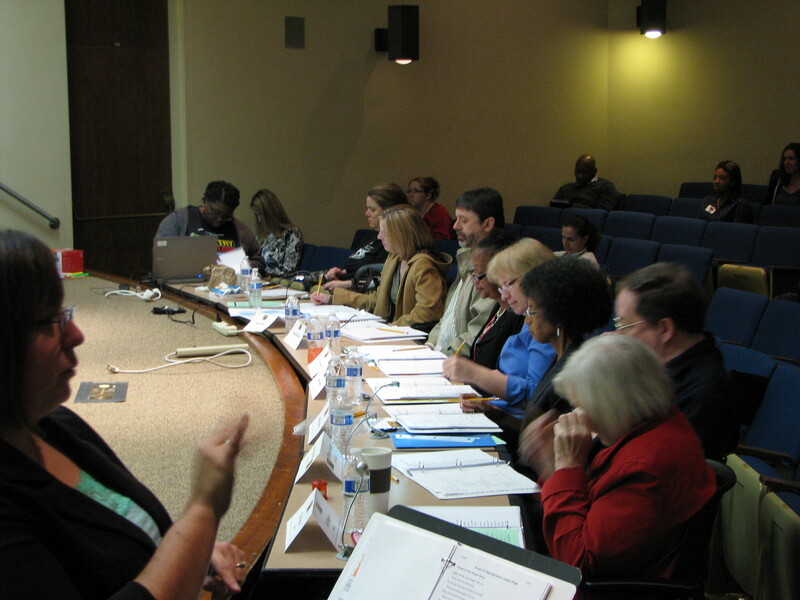 Judges included faculty from Florida State University, Florida A&M University and Tallahassee Community College. They evaluated the students in six different areas: Physical Presence, Voice and Articulation, Dramatic Appropriateness, Level of Difficulty, Evidence of Understanding, and Overall Performance. 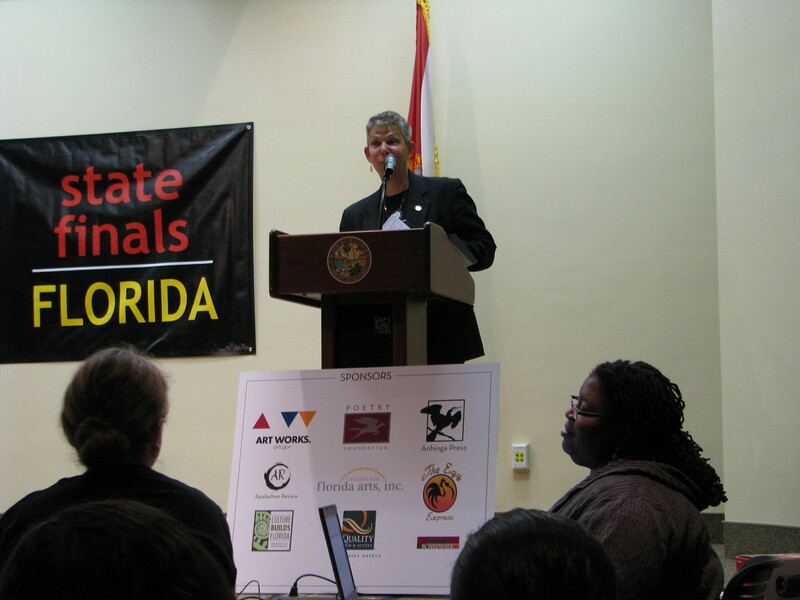 The event was hosted by Sandy Shaughnessy, Director of the Florida Division of Cultural Affairs. Students read poems on multiple themes and from various countries and parts of history. In the first round, Kamarr Le’Vere of Wekiva High School recited “April Love” by Ernest Dowson, who lived from 1867 to 1900. While students weren’t on stage reciting their poems, they spent much of their time in the green room hanging out and rehearsing for the next round. 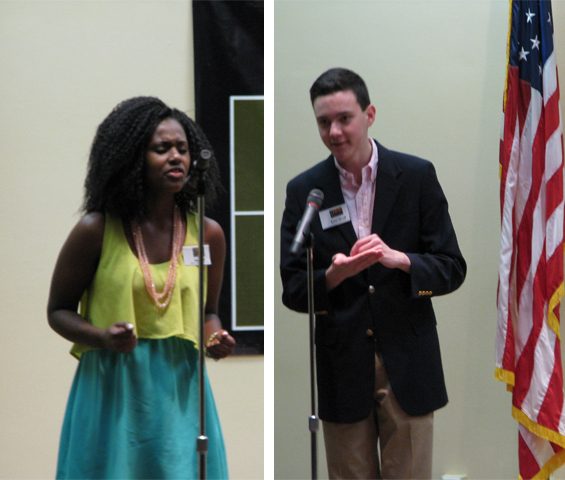 After the first two rounds, judges selected ten students to read a third poem in the final round. In the third round, Savannah McCord from the Florida School for the Deaf and Blind presented William Blake’s “A Poison Tree” in American Sign Language. 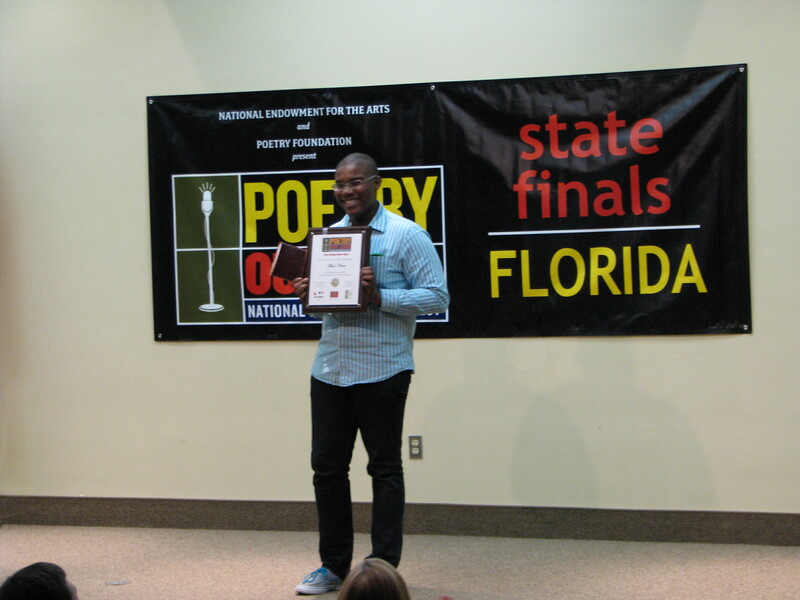 This year a new award was added to the state finals, and the Muse Award was given to David Luciemable of North Fort Myers High School. This award was given to the student whose passion and engagement with poetry stood out during his or her recitation. Honorable mentions were awarded to Desirae Lee (left), a senior at Stanton Prepatory School in Duval County and Baxter Murrell (right), a sophomore at Winter Park High School in Orange County. Third place was awarded to Jillian Miley, a sophomore at Spruce Creek High School in Volusia County. Following the competition, students and their families returned to the green room for a reception with staff and attendees. 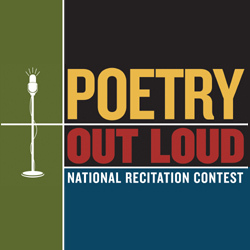 You can learn more about Poetry Out Loud by visiting the national recitation contest’s website at poetryoutloud.org. 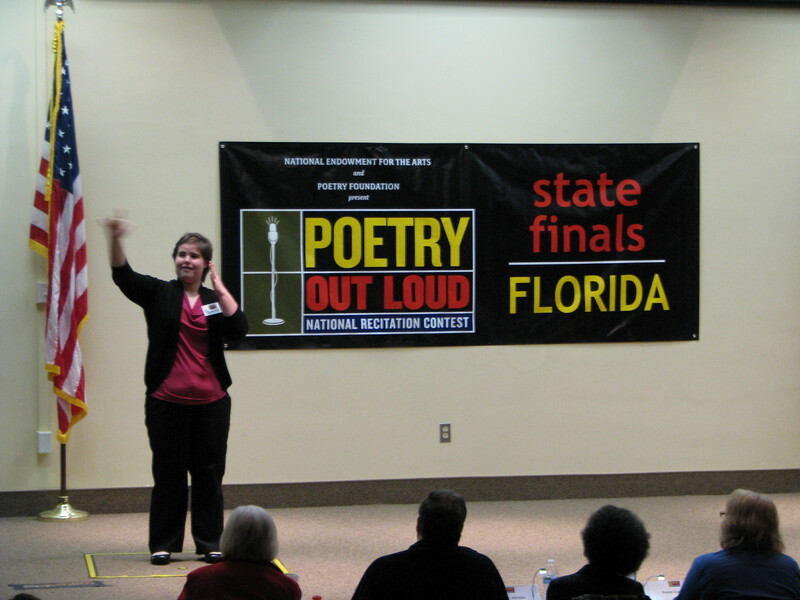 Teachers interested in participating in Poetry Out Loud next year should contact the Florida Poetry Out Loud coordinator, Alison Schaeffler-Murphy for more information. Thank you to all of the partners and sponsors who made this event possible, including the National Endowment for the Arts, the Poetry Foundation, Citizens for Florida Arts, Habana Boardwalk, Quality Inn & Suites, the Egg Express, the Apalachee Review, and Anhinga Press. We want to wish Emily the best of luck as she goes on to compete against all the other state champions in Washington, D.C. at the end of April! 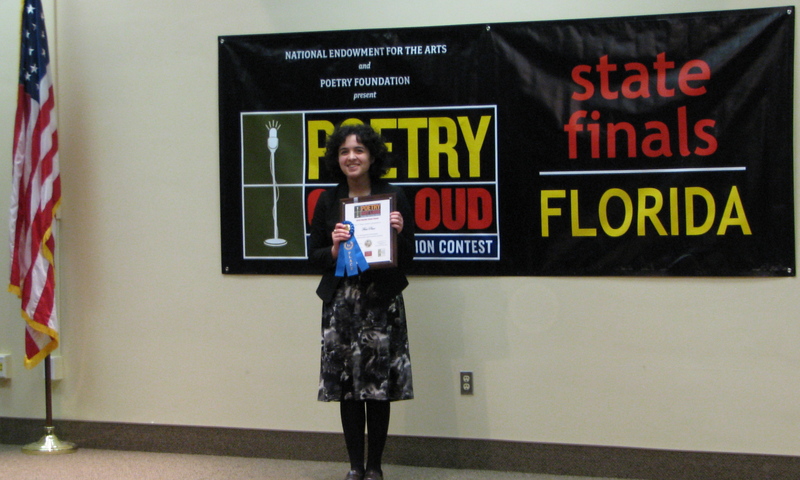 Alison Schaeffler-Murphy is the new Poetry Out Loud coordinator for state of Florida. Alison previously worked as an intern here at the Florida Division of Cultural Affairs before joining the staff full-time this September. In addition to coordinating Poetry Out Loud, Alison is a program manager for our Individual Artist Fellowships, works with Citizens for Florida Arts, and helps coordinate many of our art exhibitions. 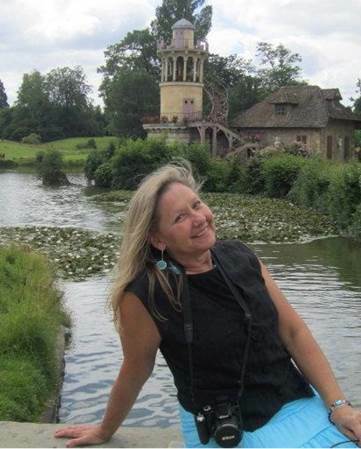 Alison recently completed two graduate degrees at Florida State University in art history and arts administration. 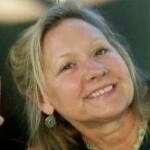 Prior to this, Alison owned Tints and Reflections Studios where she designed and fabricated one-of-a-kind fused and leaded art glass creations, which have been exhibited at regional and national glass expos, indoor and outdoor art shows, and in a variety of galleries and museums. She has also spent time directing art festivals, judging art shows, and serving as a board member for various arts associations. 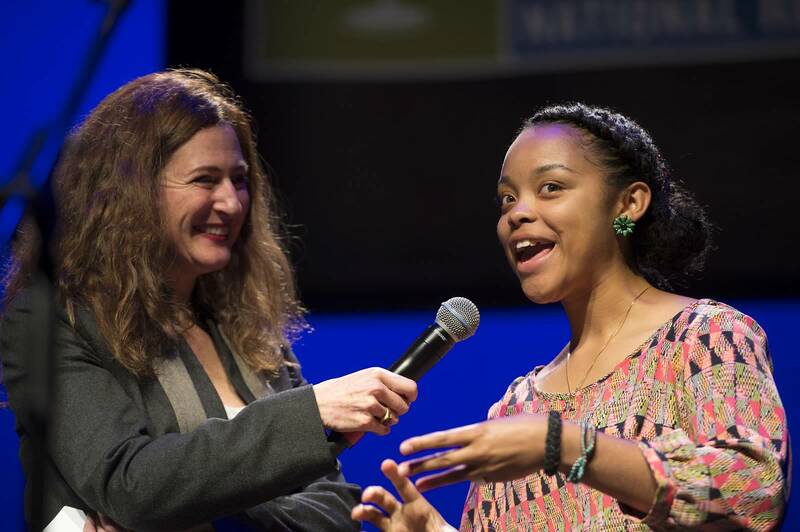 Right now Alison is busy reaching out to language arts teachers across the state and distributing Poetry Out Loud information packets to schools, but she was able to take some time to answer a few of my questions about her background in the arts and how programs like Poetry Out Loud contribute to our state. Alison: Looking back I can see that creative expression has always been important to me. During my elementary school years, I enjoyed being in school plays and lived for those extraordinary visits to art and music classes. I fondly remember tinkering at my grandparents’ piano, and I eventually became a flute player. Although I was sure in high school that I was destined to be a writer, my primary creative focus has since been with the visual arts. Correspondingly, while earning my MA in Art History I revisited my early interest in being a writer and now relish researching and writing about artists and their work. 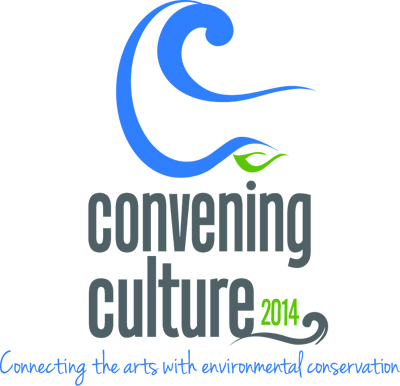 DCA: What made you decide on a career in the arts? Alison: I credit my sister with bringing me back around to studying the arts. For a very short time I seriously considered being a nutritional doctor, but one day my sister noted how perplexed she was that I wasn’t studying art. Kim noted that she only knew me to be completely at peace when I was involved in creative self-expression. Her statement gave me a sudden illumination of self-knowledge, and that’s when I decided to become an art teacher. While earning my bachelor’s degree in art education at Florida State, I took a class in stained glass and I’ve been creating glass art ever since. 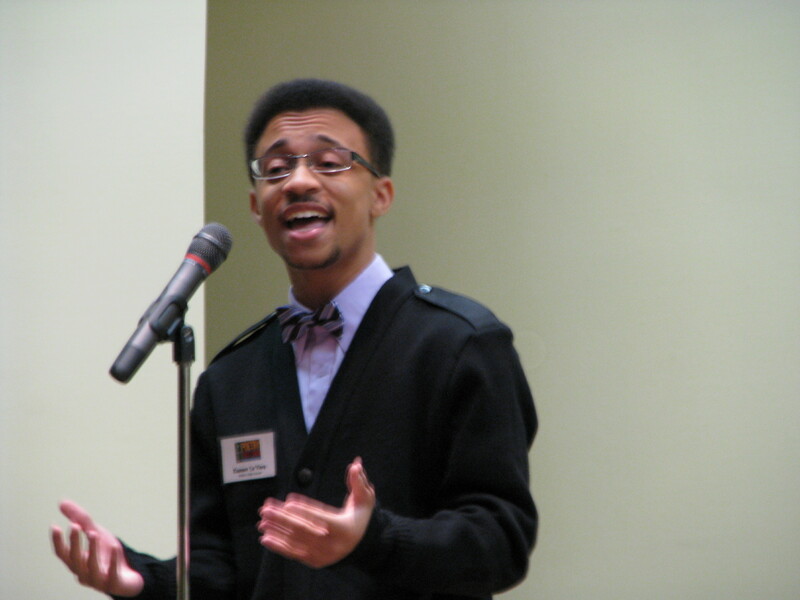 DCA: You are the new Poetry Out Loud coordinator. Are you a fan of poetry? Do you have any favorite poems or poets? Alison: In addition to writing poetry in high school, I read quite a bit and favored Robert Frost’s poems. Over the years I’ve continued to write poems. In fact, I’ve created a glass art series I call my “Haiku Series,” that incorporates self-authored haiku poems that evolve alongside the glass art piece itself. Although I haven’t seriously studied poetry in a very long time, as the Poetry Out Loud State Program Coordinator, I’m falling in love with poetry all over again. I’m enjoying revisiting some past beloved poets like Basho, Frost, Hesse, Thoreau, and Whitman as well as discovering new contemporary favorites like Lisa Zaran. DCA: The Division of Cultural Affairs believes in the motto “Culture Builds Florida.” What do you think when you hear that phrase? 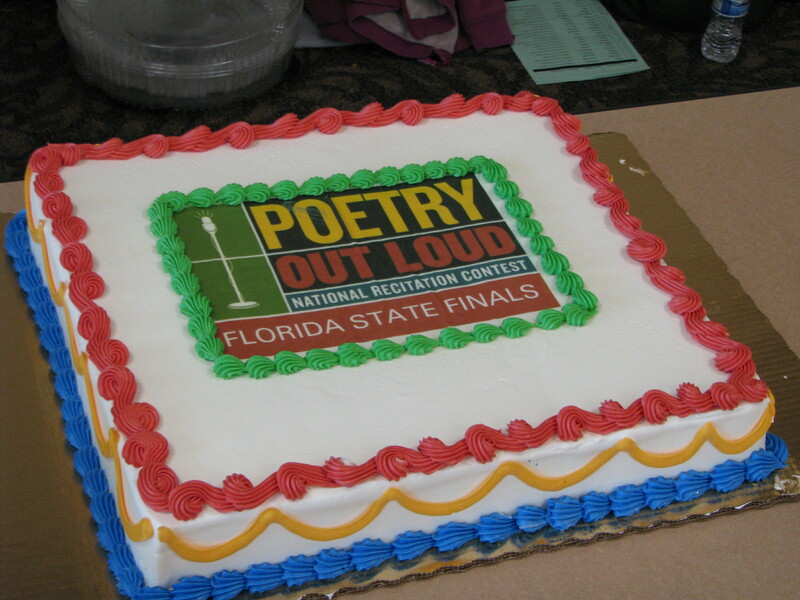 How do you think programs like Poetry Out Loud contribute to our state? Alison: I love the DCA’s “Culture Builds Florida” slogan because it highlights how importantly the arts influence not only Florida’s economic growth but also their power to build a sense of community between people. In addition to the positive effects that the arts have on individuals’ intellectual, spiritual, and physical well-being, the arts foster cultural, environmental, and global awareness. 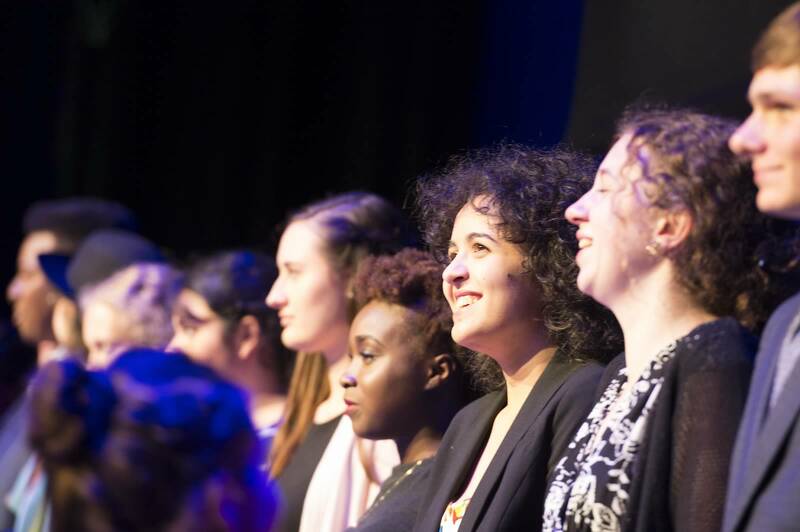 The Poetry Out Loud program is important to this end because poetry has the expressive ability to paint images with words that can bring awareness to individual and collective concerns. Students who participate learn important public speaking skills while increasing their self confidence, creativity, and empathy. It’s also valuable to see our Florida teachers and students working together toward the common goal of sending one of our many talented high school students to Washington, DC to compete in the National Finals. Alison while in France studying Parisian arts and culture as an International Exchange Student. Photo submitted by and used with permission of Alison Schaeffler-Murphy. 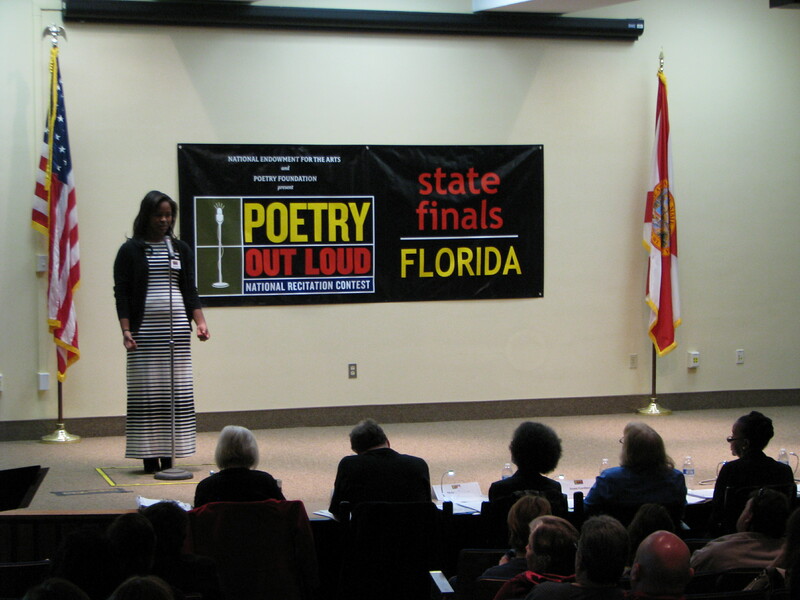 For more information on Poetry Out Loud, take a look at the blog entry from last year’s state finals and visit the Division of Cultural Affairs Poetry Out Loud page. If you are a teacher who would like to participate in Poetry Out Loud, contact Alison Schaeffler-Murphy for more information.